KIRF Director Mark Kirwin and aid volunteers CJ Paone and Patrick Rea from Ventura, California are returning from a challenging but successful disaster relief effort in Haiti this weekend. In spite of the difficult road conditions, power outage, lack of hotels, the fuel shortage, grinding traffic and the language barrier, they were able to accomplish a lot due to their local contacts in Haiti and years of disaster relief experience. In the first 3 days in Haiti, they, with the invaluable help of local Haitian business owner Lance Durban and the firm Manutech, were able to deliver about 15,000 pounds of food, water and other requested supplies to families who had lost their homes , jobs and, for many, loved ones. Many of the earthquake survivors that KIRF helped were living outside in ad hoc tent camps that were known to only the local Haitians. These families were in desperate need. For many of them their "KIRF family care packages" of culturally appropriate food, water, water filters and other living supplies was the first earthquake relief they had received. The KIRF volunteers worked with a group of motivated and knowledgeable local Haitian volunteers--employees of Manutech, many who has lost their own homes and loved ones. Together in a hot warehouse the KIRF volunteers and Haitians worked for hours converting thousands of pounds of food staples and supplies, many purchased inside of Haiti by KIRF to help local farmers and venders, into single family care packages. 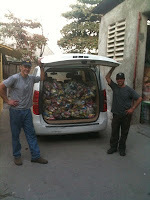 Then, each day before dark, they delivered these packages to homeless earthquake survivors in need. 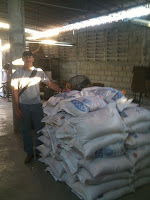 After only a week on the island, KIRF was able to deliver a total of 22, 000 pounds of food supplies through their local informal aid network with Manutech and our other contacts in Haiti and the order of Salesian monks in the Dominican Republic. We were able to get aid to previously undiscovered enclaves of homeless families and groups of children who were surviving just outside of Port-au-Prince. These undiscovered tent camp location were communicated to other local aid groups and to the amazing US 82nd Airborne soldiers who will be directing delivery of aid to them from the larger aid groups. 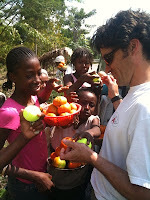 To our supporters here in the United States, and to our new friends in Haiti and the Dominican Republic: Thank you. We could not of done this with out your help.